Kit re-released under Zvezda label twice in 1990's. Available at Plastic Modeler's site for $14.80. Copyright is 1960's on my kit. Italaerei has shortened their name to Italeri over the years. They are an older prolific model company based in Italy. They make all manner of model subjects in the popular scales. The 75 mm Pak 40 was one of the most important German anti-tank guns in WWII, as it was capable of detroying any tank of the Allies. It was designed in 1940 and was put into service on the Russian front at the end of 1941, to face the new Russian tanks. It appeared in the other theaters of operations in 1942. It was manufacured in a very large number and was employed by the anti-tank battalions (Panzer Jager Abtellung) of armored divisions, Panzer Grenadier and infantry as well as by the anti-tank platoons (s.Pak Zug) of the Panzer Grenadier regiments. In both the wheel-mounted model (like this kit) and mounted on several types of hull. It featured very up-to-date characteristics such as torsion bar suspensions and double baffoe muzzle brake that ensured a good field and rate of fire in spite of its light weight. In addition, these special features made it possible to mount this gun to a large variety of vehicles and to easily displace it even in irregular areas. The 75 mm gun was 46 caliber long, I.e. 3.45 m, and was capable of firing 12 shots per minute and of piercing a 130 mm thick armor at a distance of 1,000 meters. This kit came in a shrink-wrapped tray and lid type box, that is blousy and has a letter L void around the parts. 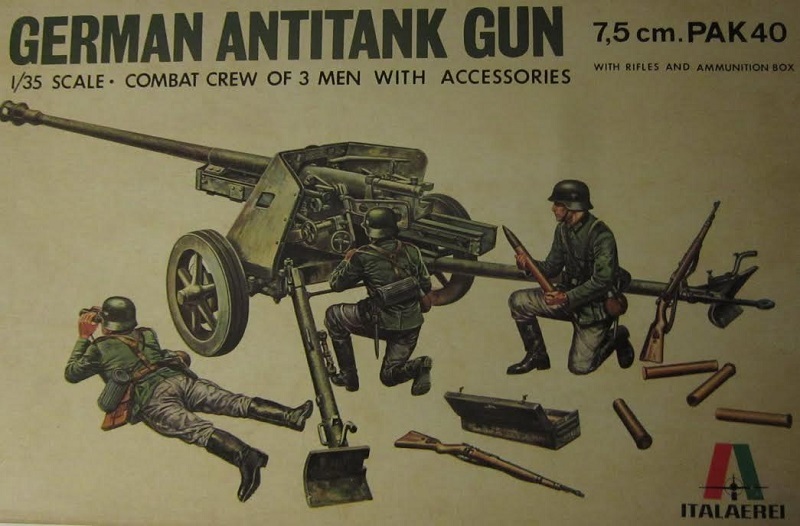 The box art shows the PAK 40 and 3 man gun crew posed against an all-white background, similar to how Tamiya does their box arts. The gun is overall earth-yellow. One crewman is lying prone and looking through binoculars. A second crewman is aiming the gun and the third man is holding a round. Both these last 2 men are kneeling on one knee. The men all wear field-grey uniforms, jack boots and steel helmets. There are 2 rifles, 4 empty shells and an open ammo case spread around the gun. One side panel has a small repeat of the box art, followed by the history of the PAK 40 in Italian and English. This kit holds 2 dark-green trees of parts in a sealed cello bag and a decal sheet and metal spring in a small cello bag. The instructions complete the kits contents. The instructions consist of a single sheet that accordion-folds out into 6 pages in 6" x 10" page format. Page 1 of the instructions begins with a black and white illustration of a profile of the PAK 40, followed by the history of the gun in Italian and English. Page 2 begins with general instructions in 4 languages, including English, followed by the parts trees illustrations. Pages 3 & 4 have 4 assembly steps that are not numbered. The trees are numbered, but not alphabetized. Page 5 begins with a inky black and white photo of the model and crew made up, above a 2-view of the gun for painting and marking instruction. It can be overall eath-yellow or a base of the earth-yellow with dark-green spots. 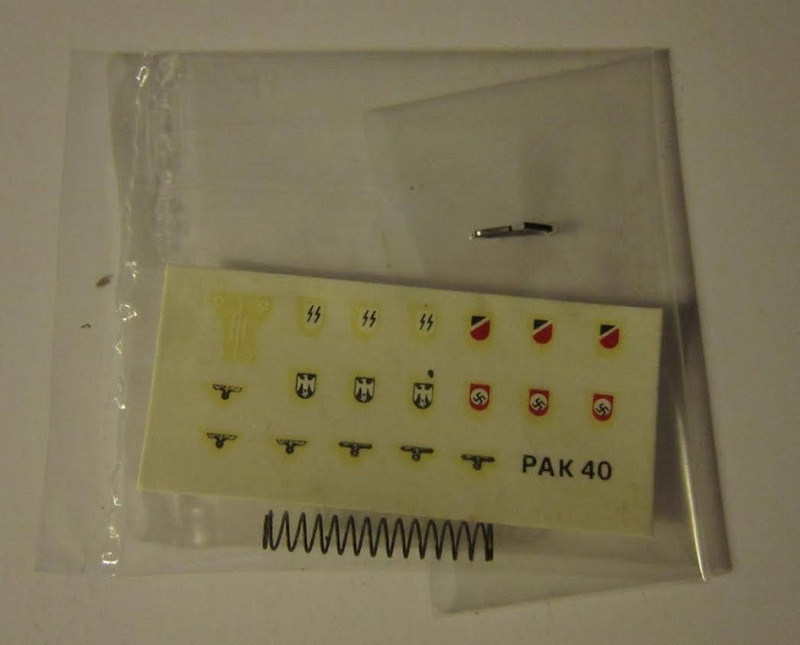 One tactical mark for towed artillery is provided on the decal sheet. Page 6 begins with illustrations of the figures and instructions for applying steel helmet marks for either Wehrmacht or SS and beast-eagles and a uniforms painting guide. Below them is the history of the gun in French and German. 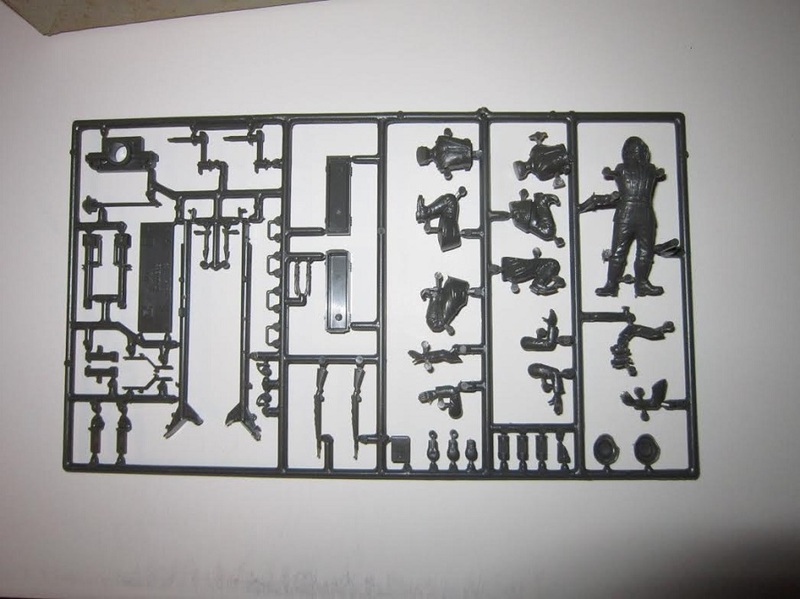 The small decal sheet and a metal spring complete the kits contents. 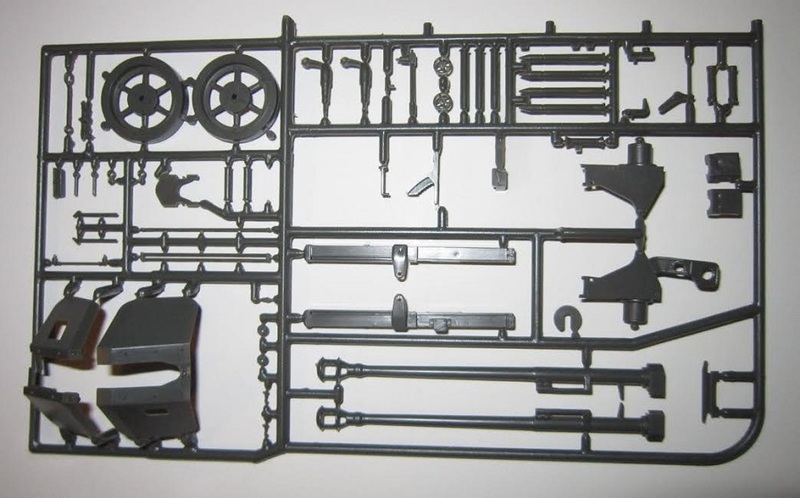 I don't see the spring shown anywhere in the instructions, so I assume it's excess and not needed to complete the gun. I bought my kit way back in the 1960's at my local hobby shop. Highly recommended. It makes up into an instant diorama.